Why would you want to cascade a rat-race? Cascaded couplers are known to provide wider bandwidth than their one-section counterparts. Here's an example of a cascaded 90 degree coupler that achieves equal split in microstrip. Here's two references on this idea (provided by Steve) that describe the cascaded rat-race (it is not original to the Microwaves101 web site). Later we'll dive into the math and present further information. A New Class of Multisection 180 Hybrids Based on Cascadable Hybrid-Ring Couplers, Kian Sen Ang et al, IEEE MTT Vol. 50, No. 9, September 2002. 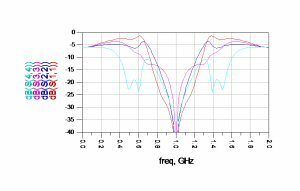 A New Class of Wideband Multisection 180 Hybrid Rings Using Vertically Installed Planar Couplers, Chun-Hsiang Chi and Chi-Yang Chang, IEEE MTT, Vol. 54, No. 6, June 2006. The cascaded rat-race cannot be laid out in a single plane, it requires three-D. The basic idea is to use an unequal-split rat-race fed at the "sum port", which is much like a Gysel splitter. 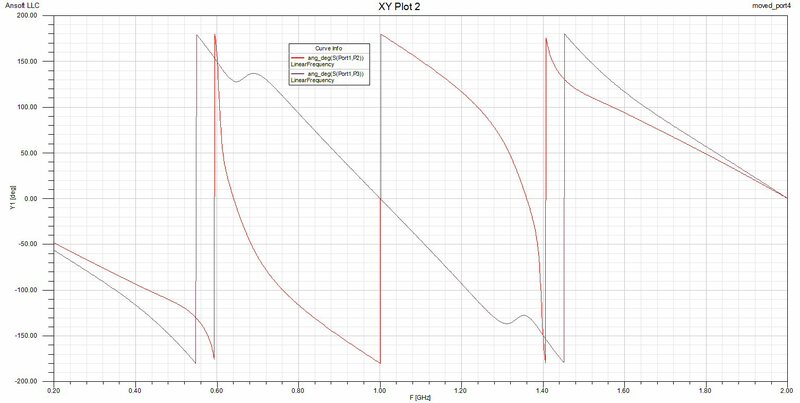 Two unequal signals pass out of the first splitter, in phase, and enter the second one. The second splitter is set up as an unequal splitter but in the opposite sense (Z1 becomes Z2, and Z2 becomes Z1). We arrived at the values of Z1 and Z2 by tuning the circuit, not with fancy-pants algebra (but we'd be delighted to present the derivation some day). In April 2011, we were looking for someone to rearrange the topology to create a cascaded circuit with outputs 180 out of phase. We even offered to fifty dollars to the first person who could send in an answer without cheating by adding a 180 degree section to one of the outputs...Well, this contest only took a weekend to finish! Steve sent in the solution. Here's a guy that won't have trouble finding a job even in a recession! Nothing like coming back from a vacation to find a brainteaser up on Microwaves101. Gave me an excuse to goof off a little before I had to get back to real work! I took the design and simulated it in Ansoft Designer, using the same Z1 and Z2 you specified, and modified it to the circuit shown in the attached zip folder. All ports are 50 ohm, just like in yours. I moved ports 3 and 4 to take off 180 deg of signal path, and rearranged the impedances to keep the symmetry and retain the matching at all ports. The performance is not perfect (just like people! ), but I haven't attempted any tuning on Z1 or Z2, and I figure with this performance being fairly close to the circuit on the website, but with 180 deg phase difference on the output, it may be the right solution!